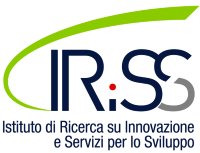 The Research Institute on Innovation and Development Services (IRISS) has been established in 2014 by merging the Research Institute for Service Industry (IRAT) and the Naples unit of the Institute of International Legal Studies (ISGI). The mission of the IRISS is developing research on innovation and international competitiveness of enterprises and territories for local development, in terms of generating economic, cultural and human value. The main research fields of the IRISS are as follows: Innovation and competitiveness; Planning and sustainable territorial management; Migration and development. Each research area is developed according to an innovative interdisciplinary approach oriented at enhancing the scientific debate on process analysis and development models, as well as at developing complex governing approaches and policies to be applied in different territorial contexts in Europe and abroad.